January 24, 2019 – The Royal Mint has unveiled the new designs that will be appearing on British coins throughout 2019, each telling a monumental story that has helped to shape Britain as we know it today. The 2019 Annual Set represents luminaries from the world of art, design and culture. 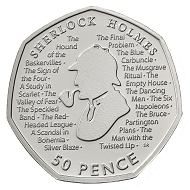 With coins commemorating the 260th Anniversary of the formation of Wedgwood pottery, the 350th Anniversary of the last entry in Samuel Pepys’ diary and 160 years since the birth of Sherlock Holmes(TM) creator, Arthur Conan-Doyle. The 75th Anniversary of the D-Day Landings will also be memorialised on a £2 coin. The 200th Anniversary of the Birth of Queen Victoria. As 2019 marks the 200th Anniversary of the birth of Queen Victoria, her reign will be celebrated with the launch of a new £5 coin. Even two centuries after her birth, the effect of Queen Victoria’s reign and the era to which she lends her name can still be felt strongly in our everyday lives. A Celebration of Sherlock Holmes. Sherlock Holmes is to feature on a unique 50p coin, 160 years after the birth of Sir Arthur Conan-Doyle. In the intuitive detective’s many adventures pursuing criminals throughout Victorian and Edwardian London, Doyle captured the imagination of millions around the world and his characters endure today. 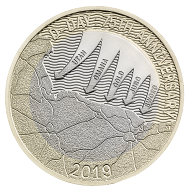 The release of a £2 coin commemorating the 75th Anniversary of the D-Day Landings marks an extraordinary event in history that is sure to occupy the thoughts of the nation this year, remembering the heroic efforts of the Allied Forces in a bid which turned the tide of the Second World War. Celebrating the 260th Anniversary of Wedgwood’s formation, The Royal Mint’s £2 coin was designed by the company that remains an innovator in the production of pottery to this day. 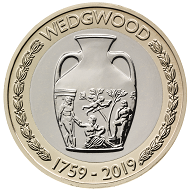 The coin celebrates Josiah Wedgwood’s pioneering commitment to shaking up one of Britain’s most traditional industries and making luxury affordable. Last Diary Entry of Samuel Pepys. 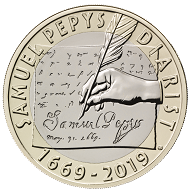 350 years after the final entry into his remarkable diary, Samuel Pepys will be honoured with a £2 coin to commemorate his contribution to the understanding of some of the most historical events of the seventeenth century, ranging from the Great Fire of London to the Plague. 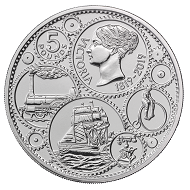 More information on these new coins is available on the Royal Mint website. A detailed biographical sketch of Queen Victoria is available online. Arthur Conan Doyle’s Sherlock Holmes did not only serve as a model for crime and detective novels for decades to come, he has also become the literary (human) character most frequently portrayed in movies and television. This video features clips of numerous actors who have taken on the role of Holmes in the past. More information about June 6, 1944, commonly known as D-Day, is available on History.com. To learn more about Josiah Wedgwood and his time-honoured company, we recommend a visit to the Wedgwood Museum. The Encyclopaedia Britannica tells you more about Samuel Pepys. His diaries are also available online.